Over on YouTube Tech Minds has posted a video explaining what Es'hail-2 satellite is and why it is interesting for hams and SDR users. 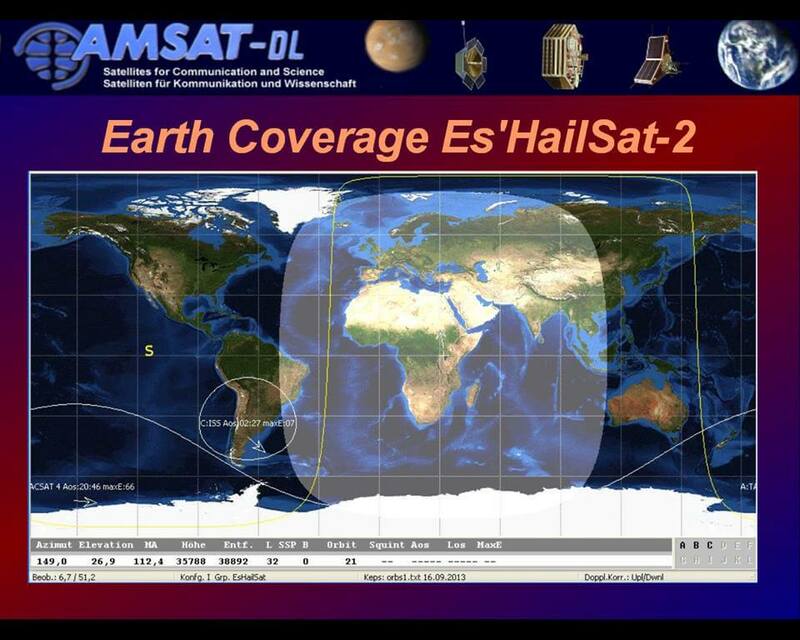 Briefly Es'hail-2 is a recently launched geostationary TV satellite that covers Africa, Europe, the Middle East, India, eastern Brazil and the west half of Russia/Asia. What's special about it is that apart from the TV transmitters, it also contains the worlds first amateur radio transponder in geostationary orbit. So amateur radio users within the region covered by the satellite can simply point their antennas to a fixed position in the sky to transmit to the satellite, and the signal will be rebroadcast over the entire covered area. With a simple LNB, satellite dish and SDR the signals can be received. After explaining Es'hail-2 Tech Minds also shows a demo of Es'hail-2 radio traffic using a public WebSDR. Es'hail 2 was launched last November and it is the first geostationary satellite to contain an amateur radio transponder. 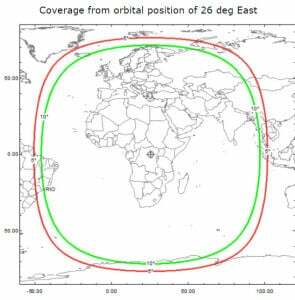 The satellite is positioned at 25.5°E which is over Africa. It's reception footprint covers Africa, Europe, the Middle East, India, eastern Brazil and the west half of Russia/Asia. Before the IOT starts there will be a TRR (test readyness review) in front of the customer. All the testplans and test-specifications will be reviewed. When the test is done there will be a TRB (test readyness board). In the TRB they have to show/present all the measurement results (e.g. inband performance like Gainflatness, Groupdelay... aso.) and compare these results with the specification in the contract. Each unwanted signal makes the measurement difficult and needs to be explained or leads to a so named NCR (non conformance report). The IOT will be done in shifts/nightshifts and with unwanted signals (if not explain able) some measurements needs to start again and again and leads in addition to a delay for the handover and operation of the satellite. Maybe that helps to understand why it is really important to have only the IOT uplink signal. To measure the pattern of each antenna the satellite will be moved east/west by the propulsion system of the DS2000 Bus and the signal level is measured by the IOT station on ground (some cuts) . The commercial beacon can maybe be switched from LEOP Omni antenna to on station antenna when the satellite is placed in the final slot. This should be the reason for the change of the commercial Ku Band beacon signal level the last days. If you are interested in receiving Es'hail 2, but live outside the footprint, or don't have a receiver then you can use Zoltan's OpenwebRX live stream of the narrow band portion of the Es'hail 2 downlink. At the moment the beacon doesn't appear to be transmitting, but we expect it to be on and off during the next few days. In his set up he uses an RTL-SDR V3, Inverto LNB, 90cm dish, a DIY bias tee and a Raspberry Pi 3. He also took a recording of the pirates CW transmission shown in the video below. Es'hail-2 live, CW signal 2019.01.17. Thank you to Zoltan for submitting his scripts for installing the rtlsdr-wsprd WSPR decoder onto a Raspberry Pi, and showing us how to configure it for an RTL-SDR V3 dongle running in direct sampling mode. This set up allows users to create an extremely low cost and permanent RX WSPR monitor. WSPR is an amateur radio digital HF mode designed to be decodable even if the signal is transmitted with very low power and is very weak. It can be used to help determine HF radio propagation conditions as WSPR reception reports are typically automatically uploaded to wsprnet. Direct sampling mode on the RTL-SDR V3 allows you to receive HF signals without the need for an upconverter. For best results it is recommended to use a simple bandpass filter for the band of interest. Zoltan's tutorial comes with a companion YouTube video where he demonstrates his set up. He uses a random wire antenna on his roof directly connected to an RTL-SDR V3, which is connected to a Raspberry Pi 3. The Pi 3 communicates to his home network via an Ethernet cable. Today SpaceX have successfully launched and deployed the Es'hail-2 satellite which is now in geostationary orbit. This launch is special for amateur radio enthusiasts because it is the first geostationary satellite that contains an amateur radio transponder on it. The satellite is positioned at 25.5°E which is over Africa. It will cover Africa, Europe, the Middle East, India, eastern Brazil and the west half of Russia/Asia. Unfortunately, North America, Japan, most of South America, Australia and NZ miss out. The satellite has a two bandwidth segments, a 250 kHz narrow band for modes like SSB, FreeDV, CW, RTTY etc, and a 8 MHz wide band for digital amateur TV (DATV) modes like DVB-S and DVB-T. The downlink frequencies are at 10 GHz so a low cost TV LNB could be used as the antenna. For receiving the narrowband modes, an RTL-SDR or similar SDR could be used, and for the 8 MHz DATV modes a standard DVB-S2 set top box can be used to receive and decode the video. For uplink, the transmission frequency is at 2.4 GHz. According to the commissioning order of the satellite, it is expected that the AMSAT transponders will be activated only after all tests have been passed, and after other higher priority commercial telecommunications systems have been activated. This is expected to take about 1-2 months. Over on YouTube channel Rate My Radio has uploaded a set of three videos showing how to use an SDRplay RSP2 as a low cost spectrum analyzer to measure the inter modulation distortion (IMD) performance of lower end hardware TX capable radios. The test can only be performed on radios that have IMD performance less than that of the RSP2, so very high end amateur radios cannot be tested. Jarrad also covers how with just an SDR Play and a 'rubber ducky' antenna, station performance can be monitored in real time. Why would a Ham want to do this? The answer is simple: To defend their station performance against that on air Expert, who got their ticket when you needed to send CW at 50WPN, who served in the military radio unit for 20 years, has 3 engineering degrees and worked as a professor at both MIT and Havard, not to mention the times they lectured at Cambridge & Oxford. With an SDR Play and a bit of simple math, any OM can put such experts in their place. Below we only post the third video of the three part series. Links to Part 1 and Part 2 are available in those links, or on his channel. Cubesats are small shoebox sized satellites that are usually designed by universities or amateur radio organizations for basic space experiments or amateur radio communications. Typically they have an orbit lifespan of only 3-6 months. 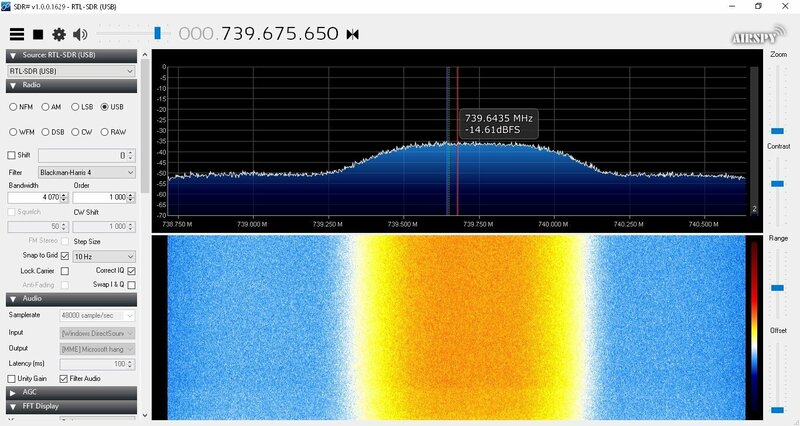 Cubesats typically transmit signals at around 435 MHz, and they are powerful enough to be received with a simple home made antenna and an RTL-SDR. To help with this Thomas N1SPY has created a YouTube video where he shows exactly how to construct a cheap eggbeater antenna made out of a few pieces of copper wire and an SO-239 UHF connector. Later in the video he demonstrates some Cubesats being received with his antenna, an RTL-SDR and the SDR-Console V3 software.